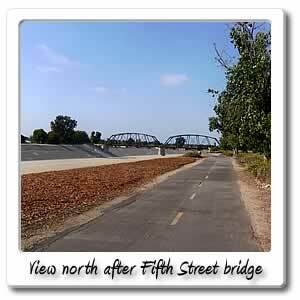 Welcome to Fifth Street on the Santa Ana River bicycle trail. 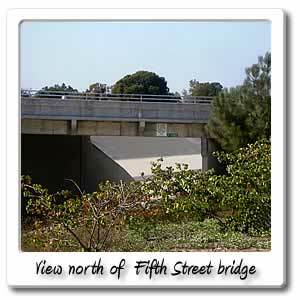 We're now at Fifth Street, at this point you'll be hitting the 9 mile marker, 45 minutes in from the beach. A few miles east will take you to Downtown Santa Ana. There's not much to see upon exiting either direction, except a couple parks. 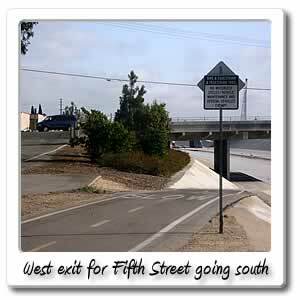 If you exit and go east you'll see Spurgeon Park, at 2701 West Fifth Street in the the City of Santa Ana. This 2.1 acre park has picnic tables and restrooms. Going east for less than 1/4 you'll see a Hamburger place at the next corner at Fairview Street. If you exit and go west at 3311 West Fifth Street, you'll see 6.4 acre Cesar Chavez Campesino Park, which has a playground, handball courts, picnic area, restrooms, and 23 parking stalls and is surrounded by Willowick Golf Course. Next exit is Fairview Street .7 miles north. A 1/4 mile south is First Street, which has more to offer when it comes to food and drink.